For my research topic, I have chosen to look at how First Nations groups might use technology to preserve their cultures and change they way they are perceived and portrayed in today’s society. I focused my search for module 2 keeping this topic in mind. The first source I found is a Masters Paper from Athabasca University. It is titled The Perpetuation of Native Stereotypes in Film and is written by Kimberley Kiyawasew. In this paper, Kiyawasew talks about some of the stereotypes of Native Peoples that are portrayed in the film industry. She then goes on to talk about First Nations Filmmakers and how they are changing the storylines and making films that “reflect a truer representation of Native people” (Kiyaywasew, 2014, p.1). These films are challenging the stereotypes that have been previously established by the media and film industry and are a way that First Nations groups are representing themselves to the world in an authentic way. The third source that I looked at was called Reconciliation Canada. “Reconciliation Canada, an Indigenous-led organization, began in September 2012 with a bold vision to promote reconciliation by engaging Canadians in dialogue that revitalizes the relationships between Indigenous peoples and all Canadians in order to build vibrant, resilient and sustainable communities. A vision based on a dream held by Chief Dr. Robert Joseph, Reconciliation Canada’s Ambassador, to witness tens of thousands of people of every culture and faith walking together for a shared tomorrow.” On this site, you can learn about programs and initiatives surrounding Reconciliation, as well as many online videos and resources on this topic. As this is an Indigenous-led organization, I believe it to be an authentic source of information and shows Indigenous cultures using technology to represent themselves. The fourth source I looked at was Animikii. They are an Indigenous-Owned technology company based in BC on Coast Salish Territory; “Our technology enables our clients to maximize their social and cultural impact by making effective use of web-based technology. By connecting people with technology we believe that this will build a stronger identity for Indigenous people.” This is a great resource as it shows how technology is being used to represent and connect Indigenous cultures. It also has links to websites that they have created for various clients, providing access to authentic sources of information. The fifth source that I looked at was the First Nations Technology Council. “The First Nations Technology Council has been mandated by the First Nations Summit, BC Assembly of First Nations and the Union of BC Indian Chiefs to address the technology related needs of BC’s First Nations communities.” One of the goals of the First Nations Technology Council is the “revitalization and preservation of language and culture,” which fits in with my research topic. The more I research into art, technology and indigeneity, the more intrigued I am with the topic. There are many layers to the topic and it is constantly evolving as culture is not static and there is not one set definition of what culture is. In addition, technology continues to evolve so more layers become added including commodification and differing world views on this. In the journal article, “Aboriginal theater: does ’sold out’ mean ’selling out’? “ The author discusses the disparity between Western Civilizations’ view of theater and the aboriginal point of view which encompasses a reflecting of spiritual truth as they see it. He highlights the complexities of ancient, traditional Aboriginal art forms and finds that the performing arts have been portrayed as primitive ritual lacking in the sophistication and complexity of contemporary western civilization. He speaks to the ethnocentric and naïve view that western thought purports and proposes that these art forms may be difficult to interpret using western mode of thought. In the journal article “From Colonialism to Multiculturalism? Totem Poles, Tourism and National identity in Vancouver’s Stanley Park”, the author reflects about the symbol of the totem pole and questions whose culture is represented, displayed and consumed. She questions whether or not they adequately capture the complicated and diverse histories and experiences of first nations people in the province of BC. She also discusses the use of totem poles as a statement of Canadian heritage and questions the Canadian Government’s use of them for their economic and cultural value. She writes further that the displays run the risk of minimizing the histories and legacies of aboriginal people within our nation. In the article, “Authentic Inuit Art: Creation and Exclusion in the Canadian North”, the author discusses how Modern Inuit commercial arts grew out of the desires of multiple non-Inuit agencies and persons. He also discusses how these outside influences worked to create new art forms which were means of carrying out the will of these competing persons in a complex competition to control social and cultural relationships. These were appropriated by the Inuit and this new art gave them new strength to establish new economic, social and political institutions. In all, the article examines the historical support and shaping of Canadian Inuit art in the 20th century, and the consequences of outside influences. In In the article, “Indigenous culture: both malleable and valuable”, the author speaks to Ideological tensions that arise with the effort to balance the preservation of cultural integrity with the selling of marketable wares. She proposes further interdisciplinary research to develop an understanding that supports the long‐term sustainability of indigenous communities. She finds that existing discourse is currently dominated by non‐indigenous voices and Western tourism motivations, which need amelioration to better support the community‐based approach. In the article, “The Artifice of Culture, Contemporary Indigenous Art and the Work of Peter Robinson”, the author discusses the huge effect computing, Internet, and televisual technologies have had on the conditions of the production, reproduction, circulation, and consumption of cultural imagery. These technologies are fueling an economy and the commodification of art as culture. Indigenous and non‐Indigenous perspectives on commodification are likely to provide different views. The article examines the representation of contemporary, ‘non‐traditional’ Indigenous art and the definition of cultural property and identity. Aboriginal Territories in Cyberspace combines academics, artists and technologists to empower First Nation communities through new media technologies. They have created virtual worlds, mentored projects such as Kahanawake Voices; an interactive community product in which individuals share personal stories. Aboriginal Territories in Cyberspace also features articles and essays, along with a blog. This website is great to give an Aboriginal face to an area that is usual lacking in terms of multiculturalism. A project called CyberPowWow is also discussed on the site. This on-line gallery and chat space for contemporary Aboriginal art is grown breaking and unique. It was through this CyberPowWow that the creators of Aboriginal Territories in Cyberspace realized that, even on the Internet, Native people need a self-determined place to call home. Our readings over module one have demonstrated what has gone wrong in relation to indigeneity, technology and education. I wanted to seek out what has gone right and how one might replicate or improve on it. I loved the title of Ball’s (2007) paper, Indigenous Learners Online: The Future Isn’t What it Used to Be!. The paper highlights some of the most common demands for online post-secondary education, common issues and successful practices. Many of the issues were familiar to what I hear at my current school as well as at the college I used to work at; issues of internet access, a desire to learn as a cohort, challenges of work, family and community responsibilities. It got me to thinking about some of the successes that I have heard about in my workplaces. At ADLC, we have many indigenous students learning in cohorts at the school with an online teacher who makes occasional visits. At Lethbridge College, there have been some creative (and highly successful) initiatives that included cohort learning and a combination of on campus and in community learning. 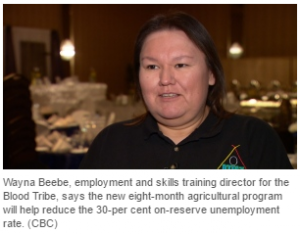 For example, the Blood Tribe Agricultural Training Initiative, saw college instructors travel to the Blood reserve as well as students travelling in to the college for field trips. This initiative was so successful that 20 of the 22 participants completed in the allotted eight months and the remaining two plan to finish. The Early Childhood Education program also has a dual credit course that is running at reserve schools near Lethbridge. In the first year, college instructors taught the course online with the assistance of an onsite facilitator. During this time, they trained the facilitator to take on more responsibility. The second year, the on site facilitator managed the course with the occasional assistance of the college instructors. A project that I found within the above resource was invaluable. I am sure that many of you have already heard of the Project of Heart, but it was my first experience with it. It is a unique site that I would classify as a Community of Inquiry. The site is intended to be a journey for students seeking the truth of indigenous peoples in Canada. There are resources by and for teachers as well as resources by and for students. Among the most impressive is this video produced by a group of Grade 8 students. The site also contains maps, historical documents, other literature, testimonials and more. Beyond the Shadows: First Nation, Metis and Inuit Student Success is a comprehensive document emerging from the Canadian Teacher’s Federation (2013) President’s Forum on First Nations, Metis and Inuit Education. 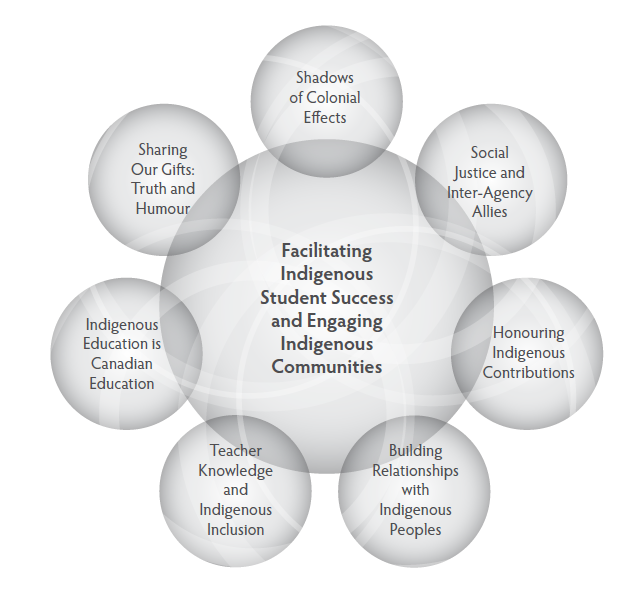 It explores seven major themes centered around facilitating indigenous student success and engaging indigenous communities. McGloughlin and Oliver (2000) raise the issue of culture in instructional design, noting that instructional design, like technology, is not neutral. The article discusses the possibility of culturally pluralistic design and suggests ten design principles for culturally inclusive instructional design. Although somewhat dated, this article addresses a very specific and relevant issue in online education. McLoughlin, C., & Oliver, R. (04/01/2000). Australian journal of educational technology: Designing learning environments for cultural inclusivity: A case study of indigenous online learning at tertiary level Australian Society for Educational Technology. 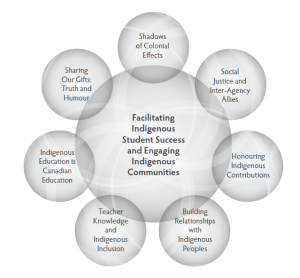 What is the purpose of aboriginal education and technology? As all of us are researching and find documentation to support any ideas or theories that we are bringing forward, it is quite difficult filtering based on our needs due to the broad nature of our topic. The following link is in UBC library about Bretts’ dissertation regarding his recommendations of Cowichan education. Cowichan tribes has over 4,800 registered members as is one of the largest sing First Nation Band in British Columbia. From Bretts statistics, 16,000 young people drop out of highschool yearly in B.C. He is using a lot of various resources and statistics to help gain some understanding of what the need is for education among the Cowichan people in School District 79. I found it very interesting as it brings some recommendations for education and possible use of technology. 1. Betts DP. Continuing education in the cowichan valley. [Order No. MQ49161]. Royal Roads University (Canada); 2000. This article online discusses some of the problems that Natives face living on the reservation. The article discusses Mike McKenzie and essentially colonialism. Statistics are provided to supplement some of the major issues around reservations. It touches a little around the educational aspects and the presented (or rejected) solutions to bringing education in reservations. I’m sure many British Columbia teachers and educators could agree with some of the financial issues surrounding educational funding. It may not be a direct impact to technology or the influence technology has upon First nations, but it would bring a necessity to having a new form of cheaper education that could prove successful with limited resources. This article may have been found by my previous classmates, but I find it relevant to module 1. This article discusses in direct relation to media, aboriginals, and the possible impact it has. I like this very simple article because it is showing some other places and positive effects that educational technology is bringing among Indigeous people. I really enjoyed this last page, as it brings forward a lot of module 1 readings. Either supporting or denying some of the ideas brought out from our week 1 and 2 readings. I hope these help people! These came up during my researching and give insight into the ‘philosophy’ of traditional Indigenous teachings. The Indigenous Participation in Information Technology (IPIT) Project University of Technology, (UTS) Sydney Australia 2005. Noam Chomsky praised Indigenous people for leading the resistance for environmental protection. And as he mentions this is happening world-wide, and has been for quite some time. This video introduces teaching resources that can be used to introduce Residential Schools in British Columbia. It includes all of the necessary teaching components needed to introduce the topic sensitively and in a culturally sound way. The First Nations Technology Council is an organization in BC whose aim is to promote the use of technology to unite, revitalize and empower First Nations communities within BC. The organization believes that technology will assist in the preservation of language and culture, enhance community connections between Aboriginal people, and provide new opportunities for jobs and economic development. In addition, the council mines data in both health and educational services for Aboriginal community members. The Technology Council also works with communities in building a a unique Community Technology Plan which is to assist in the development of sustainable technology solutions. “The Technology Council will help take the guess work out of determining short, mid and long terms goals and will be a trusted ally in your implementation of digital technologies, no matter how big or small!”. The Technology Council also supports digital skills training for those community members wishing to advance their skills. To ensure that First Nations regain full control of their education through political action. To ensure respect of the educational rights of First Nations communities. To advance and increase the quality of First Nations educational programs and services. Conduct studies and make recommendations on governments’ decisions on Aboriginal education. Manage educational programs to ensure services are developed for the benefit of the communities. In addition, the FNEC is also working on training members of the community through online learning and face-to-face classes. In 2010 the FNEC established the Kiuna Institution, a post-secondary school promoting culture and traditions for the First Nations of Quebec. This website also has a large collection of position papers, videos and documents which support their position for self governance of Aboriginal education. Although this organization mainly focuses on the Aboriginal people of Quebec, there is a plethora of information which spans Aboriginal communities across Canada.